I'm 100% an online shopper - and no, not just because it's not socially acceptable to stroll freely around a mall with your hair in a pineapple, no bra on and your duvet wrapped around your head - but because of the ease and freedom of it all. When walking past a beauty counter my instinct is to run towards it with my arms outstretched ready to swatch shiny new lipsticks to my hearts content, but I've always been a little shy of doing so and instead I prefer to head to websites like Beauty Bay. As Europe's largest independent online beauty retailer, it's no surprise that Beauty Bay is a product junkie's dream. Stocking amazing brands that can be difficult to get your hands on if you're in the UK (like Anastasia Beverley Hills, Jeffree Star Cosmetics, Zoeva, Sigma etc) it's a one-stop-shop for all of your beauty needs and I'm forever browsing their What's New page to see the latest releases. I've been testing a really lovely selection of products from Beauty Bay, so I'm going to share my thoughts with you along with a wishlist! You all know that a new lippy is one of my greatest joys in life! Despite being a brand I've heard a lot of great things about, I haven't tried many products from Stila before and this lipstick is definitely up my street. With an incredibly lightweight formula that is still hanging around after multiple cups of tea, it feels smooth to apply and comfortable to wear whilst offering an impressive amount of colour payoff. I'd describe it as a dusky mauve-toned caramel, and its gone straight in my makeup bag - love the slimline gold packaging! Speaking of dusky mauve-toned mattes, this LA Splash number is similar in colour to the Stila one with a lot more of an ashy, grey undertone... maybe that explains the shade name! I found the application to be really easy which isn't always the case with liquid lipsticks, and whilst it's fairly drying I didn't get any flaking or gathering. It's one of those products that makes me feel very 'Instagram' - if only I could nail contouring and fleeky liner, hey! 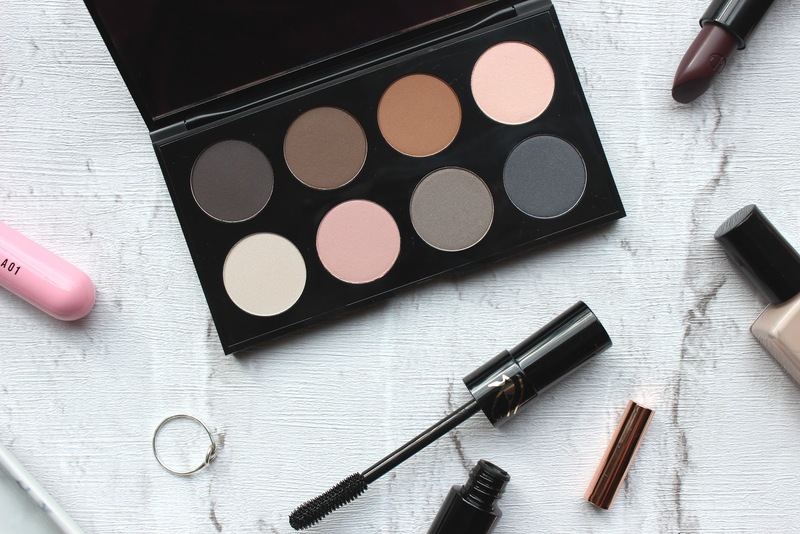 A matte eye is one of my favourite go-to looks and I'm always on the lookout for a new matte palette. I'd never tried GD Basics before and this eight-pan palette didn't disappoint! I was quite surprised to see that at least three of the shades definitely had shimmer in them, but it's that very fine shimmer that barely translates in person or in photos so you still get that chic matte look and I actually found it gave the shadows a much more expensive, luxe look. 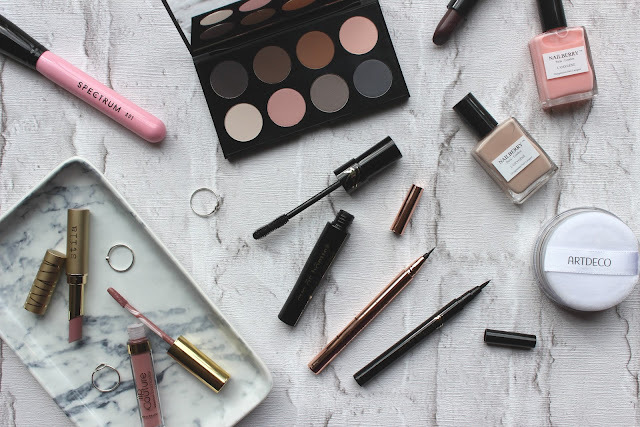 The quality is great - easily blendable and buildable, and I think there are a lot of really classic yet modern shades in here which is a steal for £19! I've been trying my best to get into eyeliner this year as it's a look I truly love but have never mastered myself, and the easiest most 'beginner friendly' products I've found have had extremely thin, brush-type nibs like this LA Splash one. Even a novice like me can get a really precise line and whilst I'm still not at the wing stage, it gives me a lot more definition and it's a real pleasure to use. How gorgeous is the packaging, too? If you like felt-pen style eyeliners, I'm sure you'll absolutely love this - the formulation is so long-lasting and didn't budge all day, yet came away easily with an oil cleanser in the evening which meant I didn't have to rub my eyes at all. Personally I found it a little trickier to get to grips with, but I was seriously impressed by its lasting power and how intensely black it was. It's definitely one that I'll be practicing with! Having heard so many amazing things about this product and seeing it in the UK Beauty Shortlist Awards for Best Mascara I was so excited to try it, and after doing so I'd definitely recommend it. I'm such a fan of plastic brushes as they have the ability to give you a length, volume and a beautiful fanned-out look without a clump in sight, which is exactly what this does. Packed with Moringa Oil, antioxidants and vitamins, it's a mascara that has made me stray from my usual favourites and I adore that it gives maximum effect with minimal effort. Okay, this colour is pretty much Halloween heaven! October 31st is only a few weeks away and this time of year always inspires me to experiment with my lip colour and try something more fun and vampy. 'Plum Noir' is, as the name suggests, a deep blackcurrant plum shade with burgundy undertones and is a satin finish, which is my favourite as it's the perfect balance between matte and sheen. Although the colour isn't for the fainthearted, the creamy finish makes it surprisingly more wearable and I think this would look really cool worn with a flawless base, winged liner and highlighted cheeks. I can't quite explain just how soft this brush is so you're just going to have to try it for yourself, and I promise you're going to love it! The shape makes it extremely easy to apply product in just the right area and it never picks up too much, which allows you to expertly bronze and powder your skin. As previously mentioned, I also use this to sweep away any excess fixing powder and it's one of those brushes that you never want to stop running over your face. I only wish it was in their Marbelous packaging, as the bright blue, pink and purple design is stunning but doesn't always go with my Instagram! Pricey but extremely pretty, these nail polishes are really something special! I wore mine for at least four days without any chips which is impressive as I'm constantly tapping away at my keyboard for hours on end or doing the washing up. They have a lovely silky texture that dries quickly, which means that you can do your nails whilst watching Gogglebox without ending up with messy cuticles and a ton of annoying smudges. 'Elegance' is a nice soft pale ballet pink, and 'Simplicity' is my favourite as I love those elegant, polished mocha nudes. Having tried and fallen in love with such a wonderful selection of products and as Beauty Bay stock a ton of my favourite brands, the top five items on my current wishlist are: Anastastia Beverly Hills Brow Wiz, Dr Brandt Pores No More Vacuum Cleaner Blackhead Extractor, Laura Geller Baked Gelato Swirl Illuminator, Too Faced Perfect Lips Liner and Oskia Micro Exfoliating Balm. I'd better get saving my pennies! This post is sponsored by Beauty Bay. All opinions are 100% my own and honest. Affiliate links have been used. For more information, please see my disclaimer here.